Published on July 20, 2018 in Squash. 0 Comments Tags: David Palmer, Hall Of Fame. Published on May 21, 2018 in Champion Mindset, Fun Stuff, Inspiration, Motivation, Squash, Squash Tips and Training and Drills. 0 Comments Tags: Squash Infographic. CLICK ON THE IMAGE TO ACCESS THE INFOGRAPHIC! Published on April 15, 2018 in Sports Statistics, Squash, Squash Competitions and Squash Tips. 0 Comments Tags: Com Games Squash, Commonwealth Games Squash, Squash Com Games. The East Coast Squash Academy recently launched a colourful Commonwealth Games Infographic…. Have a look! Published on November 16, 2017 in Squash. 0 Comments Tags: Aussie Squash, Is Squash Dead?, Squash Australia, Squash In Australia, The State Of Squash. Squash has always been popular in Australia, but it hasn’t been without its ups and downs. Aaron Frankcomb of The East Coast Squash Academy in Sydney explains Squash’s recent rebound. That is encouraging for all us squash fanatics! Published on February 10, 2016 in Champion Mindset and Squash. 0 Comments Tags: Squash Clubs. It’s been said it takes a village to raise a child… and it takes a collection of squash clubs to create a champion! Published on February 1, 2016 in Squash. 0 Comments Tags: East Coast Squash Academy, Madeline Perry, Sydney Squash. Sydney, NSW, Australia (19, January, 2016) – The East Coast Squash Academy is proud to announce and welcome Former World #3, Madeline Perry, as the Academy’s Head Professional. Perry will be responsible for managing and coaching a variety of programs at both Willoughby Squash Club and Bondi Waverley Squash Club. Perry joins the Academy after playing full-time on the WSA/PSA tour for the past 17 years. Perry represented Ireland in 5 Commonwealth Games and is the most successful squash player in history of Ireland Squash. She has won 13 World Tour Titles and was ranked within the top 10 WSA players for over 10 consecutive years. Perry retired from the professional world tour in the middle of 2015. Founded in 2011 when Aaron Frankcomb retired from the Professional Squash Tour, the East Coast Squash Academy set out to create a business model to expand the presence of squash within local communities surrounding squash centres. The first installation was at Willoughby Squash Club where Frankcomb was hired as the club’s resident squash pro. Since inception, the Academy has produced some stellar results including: Attracting a handful of junior players with aspirations of going on the professional (PSA) tour. Its junior program has the biggest contingent of players on the NSW Squash Junior ranking list, with players on the NSW junior state teams, Australian junior teams and Australian senior players. The Academy has developed NSW and Australian Junior Champions. The Academy is home base to two full time senior players that have reached careers highs of top 240 in the world on the Men’s PSA Tour. Its best female professional reached a top world ranking of 130. The junior program now boasts over 500 children participating in weekly squads and training sessions. Memberships and participation in squads have increased by 100% and 300% respectively and tournament registrations are at an all-time high. The Bondi Waverley Squash Club is the second squash club to join the Academy, in 2014. Aaron Frankcomb was ranked in the top 100 professional squash players for 8 years, 4 years in the top 50, winning 3 PSA titles. He represented Australia at the 2010 Commonwealth Games, was a Junior Champion in all age groups including 2 times in the Under 19 category and holder of scholarships in the Tasmanian and Australian Institutes Of Sport. He now coaches professionally and remains Sydney’s top ranked squash player and is still considered within the top 5 players in Australia. Willoughby Squash Club has been Sydney’s premier squash club for over 30 years. Boasting 10 singles courts and Sydney’s only regulation championship sized doubles courts. Willoughby is also a site for Australia’s #1 squash store, with the largest selection of squash racquets, shoes, and accessories; the club also has an onsite restringing service. Bondi Waverley is a member-run club located in the heart of Bondi Junction. A beautiful four-court centre and bar, Bondi Waverley Squash Club has entered teams in Sydney’s pennant competition for over 40 years. In addition to courts, the club is also available for functions in the spacious bar and lounge, with pool tables and poker machines. The club is now the second location for East Coast Squash Academy and hosts annual tournaments as well as regular programs for all skill levels and age groups. Squash At The 2020 Olympics?!?!? Published on February 1, 2015 in Squash. 0 Comments Tags: 2020 Olympics, Olympic Bid, Squash In Olympics, Squash In The Olympics. The are many reasons why squash should be in the Olympics. Believe it or not, squash is still in the bid for the 2020 Olympics. 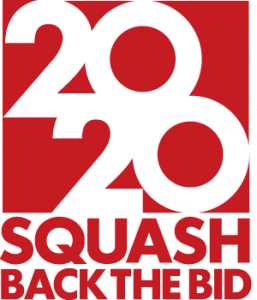 If you want to see squash in the 2020 Olympics, click on the LINK below. Published on August 30, 2013 in Squash. 0 Comments Tags: 2020 Bid, 2020 Olympics, Squash Olympics. Can you tie your shoe laces? Published on August 23, 2013 in Champion Mindset, Sports Psychology, Squash and Squash Tips. 2 Comments Tags: Shoe Laces, Shoelaces, Tying Laces. Can you tie your shoe laces? Are you sure? Watch this TED TALK video and you might realise you are part of the 80-90% who don’t tie their shoe laces correctly! Without becoming superstitious, you can establish a disciplined regimen to remove as many imponderables as possible. For example, I cut about 4″ or 10 cm off my squash shoe laces IMMEDIATELY when I unpack them from the box. I have 3 to 4 shoes that I rotate at any given time so that I am never stuck competing or training intensively with new shoes that aren’t broken in. These are some of the many details that make a difference. Published on August 23, 2013 in Squash and YouTube Videos. 1 Comment Tags: 2020 Olympics, Back The Bid, Squash In The Olympics. Now that high-speed, super-slow motion technology has finally caught up to capture the lightning quick speed, super-human athleticism, thrilling drama and excitement of this beautiful sport, how could the world not fall in love with it? How can it NOT be in the Olympics?!?! NEW! Successful Squash Strategies Program SIGN UP NOW! Subscribe To The Mindset Of A Champion Blog! Arnold Schwarzenegger 2018 – The speech that broke the Internet – You can’t NOT be inspired after watching this!